In our Kids Ministry at COTK, we want kids to know that God made them, God loves them and Jesus wants to be their friend forever. Our staff and Kids Ministry team value the partnership we have with parents in helping kids grow spiritually. While you participate in the services, your kids will be learning about God on their level. We provide a fun, safe, age-appropriate environment where your child can learn about Jesus. They’ll have a blast! They just might be dragging you to church next week. And, don’t worry; if we need you for any reason, we’ll page you on the video screen in the auditorium. Dennis and Cyndy have a passion to see your children encounter God and understand His word - all while showing them its a blast to serve God! With almost twenty years experience working with children, as well as raising three children of their own, they know a thing or two about teaching kids how to love and follow Jesus. 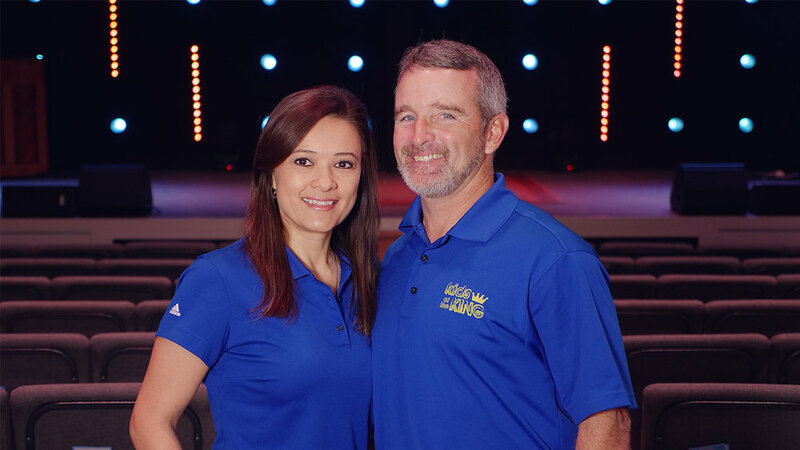 As Children's Director at Church of the King they oversee all aspects of children's ministry and ensure that your children are safe, loved and empowered to live the life that God has called them to live. They both live life loud and large and infuse that fun-loving philosophy into their ministry. Our Nursery is filled with staff and volunteers that love to take care of smaller children. They understand that your child needs special care so you can enjoy the Sunday service you are attending. In K4-5 the environment and spaces are tuned to kids that need a little more wiggle room, they are getting bigger! The games and teaching are designed for a child of this age set so that they can feel engaged and still have a lot of fun.